The possibility of reducing antiretroviral therapy from 3 to 2 drugs, and having a monthly injection alternative to daily oral regimens, moved closer to reality with favorable results from a phase 2 study of the investigational integrase inhibitor, cabotegravir (GSK1265744, GlaxoSmith Kline), in combination with rilpivirine (TMC278-LA, [oral Edurante], Janssen). 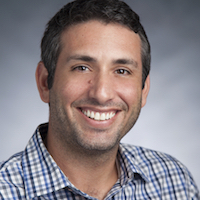 David Margolis, MD, MPH (pictured), Medical Director, HIV Drug Development, ViiV Healthcare, Research Triangle Park, NC, and colleagues reported findings from extending treatment in the open-label, phase 2b LATTE-2 trial. "The 2-drug combination of all-injectable, long-acting (LA) cabotegravir plus rilpivirine every 4 weeks or every 8 weeks was as effective as daily 3-drug oral therapy at maintaining HIV-1 viral suppression through 96 weeks and was well accepted and tolerated," they indicated. In another journal, Germs, David Back, PhD., University of Liverpool, UK, considered results in the LATTE-2 trial, noting further testing of this and other 2 -drug regimens is necessary to confirm they are comparable to conventional 3-drug combinations in producing antiviral activity, presenting a high barrier to resistance, and having a favorable pharmacokinetic and drug interaction profile. In addition, although patients in the LATTE-2 reported high satisfaction with the injections, Back emphasized that additional assessment of this route of administration is warranted. "There are challenges that remain to be elucidated such as injection volume, management of any adverse events occurring with the LA combination, the need for the oral lead-in and missed injections leading to low levels of drug in the circulation," wrote Back. The LATTE-2 trial randomized 286 patients who maintained viral suppression (plasma HIV-1 RNA <50copies/ml) on oral cabotegravir plus abacavir-lamivudine (Epzicom, ViiV Healthcare) to continue the daily oral regimen (n=56), or receive either 2 2ml LA injections of 400mg cabotegravir/600mg rilpivirine every 4 weeks (n=115) or 2 3ml LA injections of 600mg cabotegravir/900mg rilpivirine. Margolis and colleagues report at 96 weeks, viral suppression was maintained in 84% (47) of patients receiving oral treatment, 87% (100) in the 4-week group and 94% (108) in the 8-233k group. Injection site reactions were characterized as mild to moderate and rarely resulted in discontinuation, and serious adverse events were not drug related. Three patients (1%) experienced protocol-defined virological failure (2 in the 8-week group, 1 with oral treatment). "The complete week 96 dataset included here provides important evidence for both the durability of virological response and acceptability of intramuscular injections for chornic use with dual antiretroviral therapy in patients infected with HIV-1," Margolis and colleagues indicate. In accompanying commentary, Mark Boyd, MD, University of Adelaide, Australia and David Cooper, MD, University of New South Wales, Sydney, Australia, were enthusiastic about the findings, and suggested that the regimen might have even been more efficacious throughout the treatment period than was reflected in the analysis at 48 weeks. At that time point, 8 patients in the 8-week group were classified as virological non-responders, but 5 of them had viral loads of between 50 and 200 copies/ml. "It is quite conceivable that that these 5 participants...had a burst of low-level viral replication during an intercurrent event that did not represent incipient virological failure,” Boyd and Cooper suggested. “This hypothesis is supported by the fact that 4 of those 5 participants went on to virological success at week 96 without change of therapy." Margolis and colleagues emphasized the importance of this first investigation of a long-acting injectable antiretroviral therapy. "An option to treat HIV-1 without the use of daily oral medications represents a paradigm shift in the HIV-1 treatment landscape," they wrote. The report of the 96-weeks results from the LATTE-2 trial of long-acting intramuscular injection of cabotegravir and rilpivirine were published in The Lancet.